They are the cenotaphs, the places where the princes of Rajasthan were cremated and a cenotaph built in their honor. 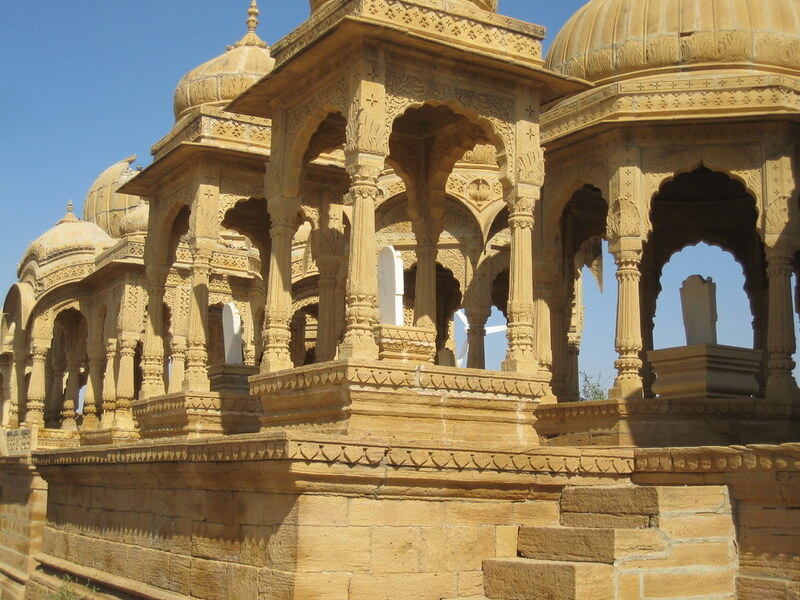 These are the cenotaphs of Jaisalmer. If you go to flickr.com and search for the word "cenotaph" and do a slide show of the results you will be absolutely amazed at some of the photographs taken of these places. I was. That’s why I wound up going to see them. It cost me 200 rupees, about $5 for a tuk-tuk driver to take me out there to see them, wait for me for half-an-hour and then take me back to the hotel. 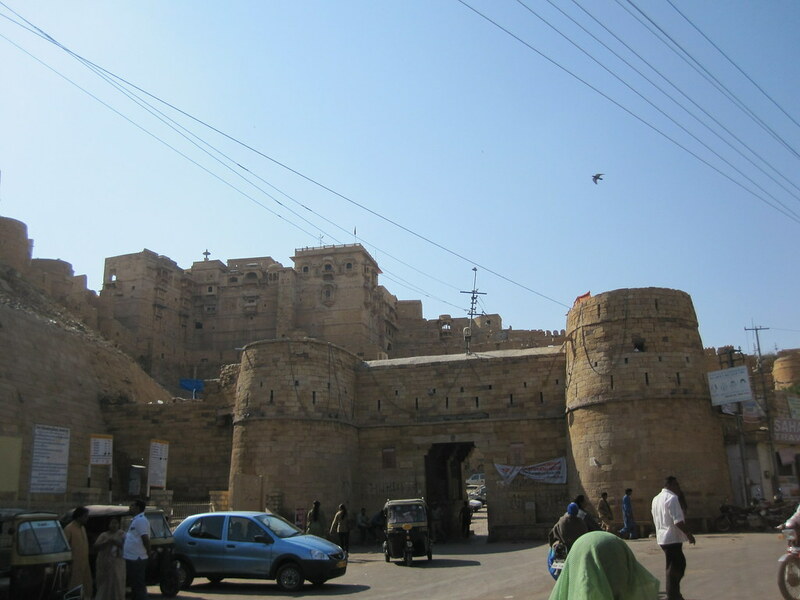 This entry was posted in Travel and tagged Jaisalmer on January 31, 2011 by Steve. It was the Jain Temple in Jaisalmer. It was in the morning. The Jain religion is very similar to Hiduism in some respects. Both started in India. Both pre-date Christianity by hundreds of years. Jainism also has several concepts in common with Buddhism. There is some people who feel that Buddhism came into being because of Jain theology and concepts. Anyway, there were quite a few people at the Jain Temple on the morning I snapped this picture. 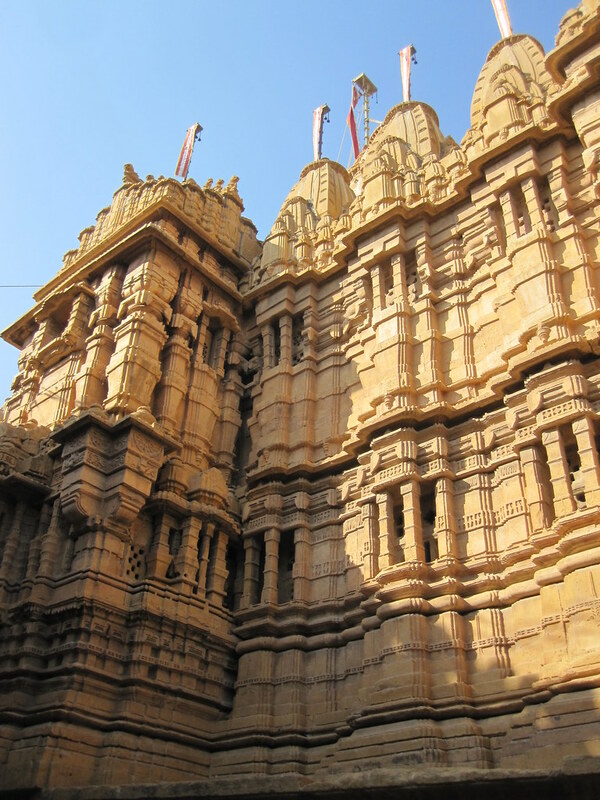 Jain temples are considered to be some of the most ornate temples in Asia. I probably should have gone later in the day. There are 7 Jane temples in Jaisalmer. This is the main temple. There is an entrance fee and a camera fee. 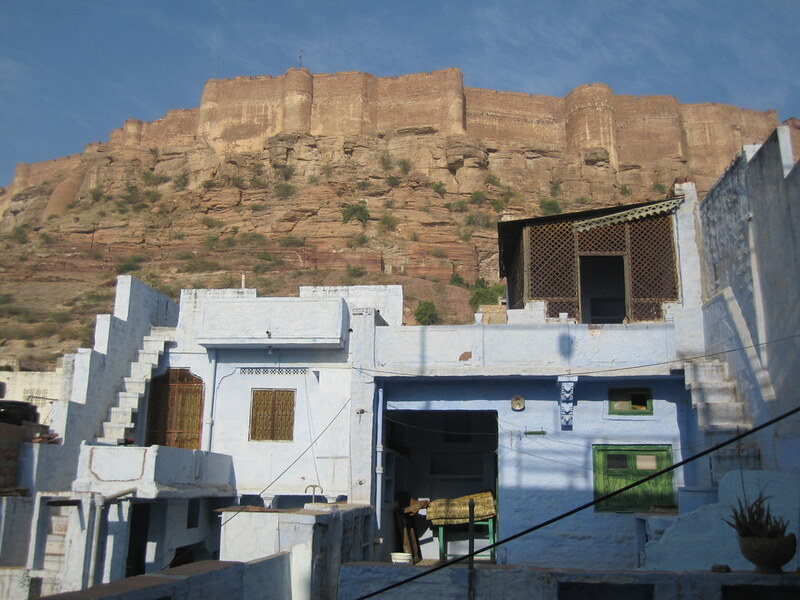 This entry was posted in Travel and tagged Asia, Jaisalmer, Temple, Udaipur on January 30, 2011 by Steve. It’s a liter bottle of Kingfisher beer. 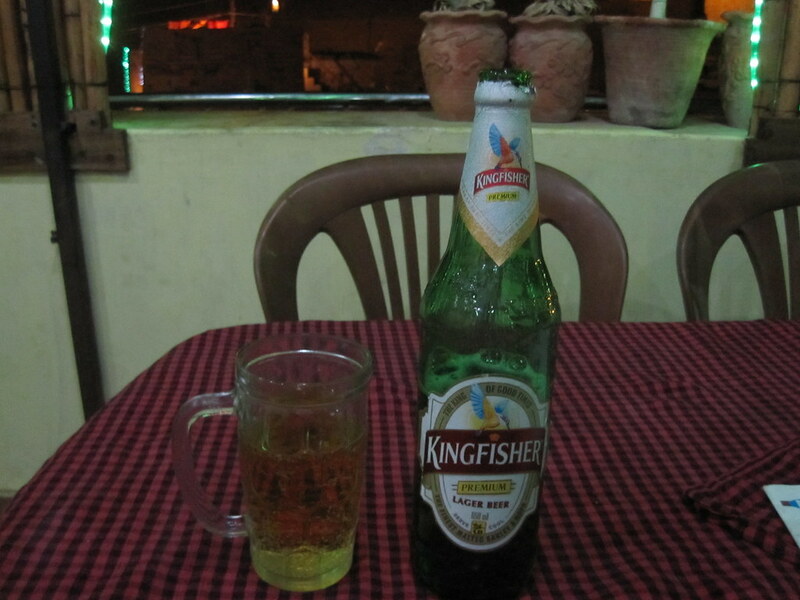 I’ve been told that the Kingfisher brand is used on several items in India, beer being one of them. The beer is a lager. I wouldn’t say it was a particularly good lager, not would I say it’s a particularly bad lager. If I were a drinking man, which I am, and drank lagers, which I do, I would drink Kingfisher lager if there wasn’t a better value around. This liter bottle of beer cost me over $3, not what I consider to be a particularly good value in beer. I would assume that, if I were in India longer and needed beer more than I do, I would find good deals on beer. This wasn’t one of them, although the view of the Jaisalmer Fort after dark from the restaurant where I sit and drank the beer was quite good. 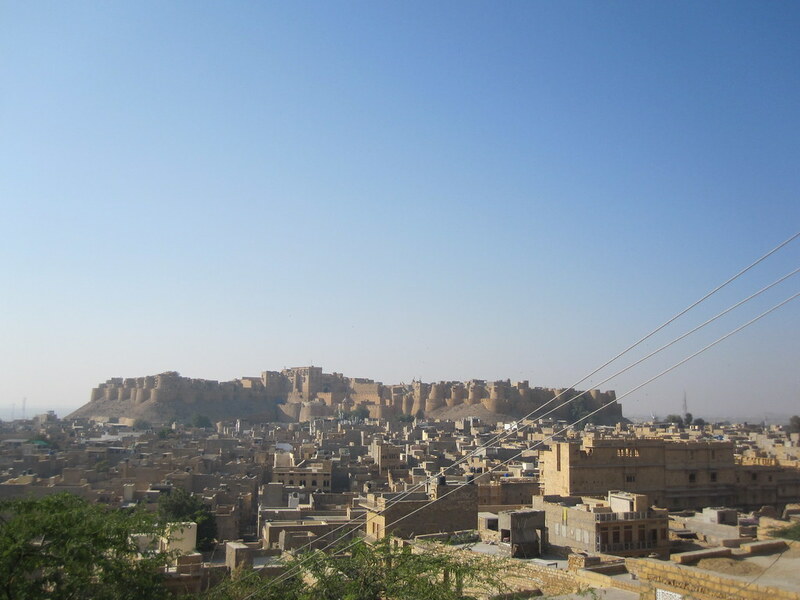 This entry was posted in Travel and tagged Beer, Jaisalmer on January 30, 2011 by Steve. I’m here to tell you that this was a fort. I had seen many forts in India. I saw the Red Fort in Delhi. I saw Agra Fort in Agra. I saw the fort in Jaipur. But this fort was unique. It had been occupied for over 800 years. Some say it’s had the longest continuous occupation of any medieval fort in the world. I could believe that. It costs nothing to go in, because everywhere you turn there are people trying to sell you things. There are also 40 hotels in the fort that want your business. This means good things for the people who live in the fort. The bad news is that all that commerce is supposedly causing an over-consumption of water which is eroding the foundation of the fort. There is an ongoing debate about whether the fort will last much longer. There have been collapses of sections of the fort with deaths involved. The fort is on the World Monument Fund’s 100 Most Endangered Sites list. All I can say is I got to see it and take a few snapshots before it goes. This entry was posted in Travel and tagged Delhi, Jaipur, Jaisalmer on January 30, 2011 by Steve. It’s pretty cool, eh? So what was happening in your country 850 years ago? In my country there were no white dudes buying up land that no one owned. No fire-water. No pollution. Man existed in harmony with nature. Sure, there were a few squabbles here and there, but nothing a minor war or two couldn’t settle for another generation or so. The people prayed to gods that made sense – the Rain God, the Fire God, the Corn God, the Buffalo God and the best god of all, the Peyote God. Life was good. Men sat around and smoked and women worked the fields and tended the children. Civilization? Bah, humbug. 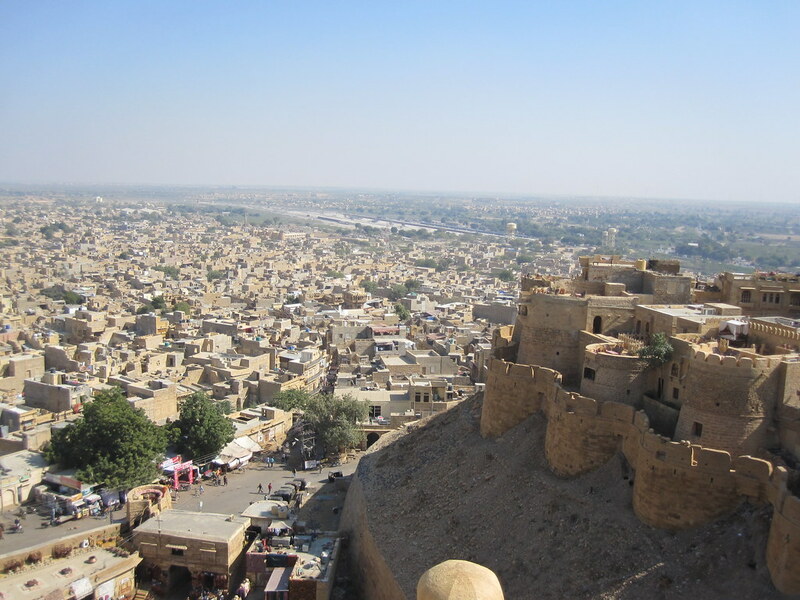 This entry was posted in Travel and tagged Jaisalmer on January 30, 2011 by Steve. All of the forts in Rajasthan were built high on a rocky outcropping to insure strategic positioning above the enemy. This gave them wonderful views of the landscape around them. It’s worth going into the fort if for no other reason than to see those beautiful landscapes. This entry was posted in Travel and tagged Jaisalmer, View on January 30, 2011 by Steve. 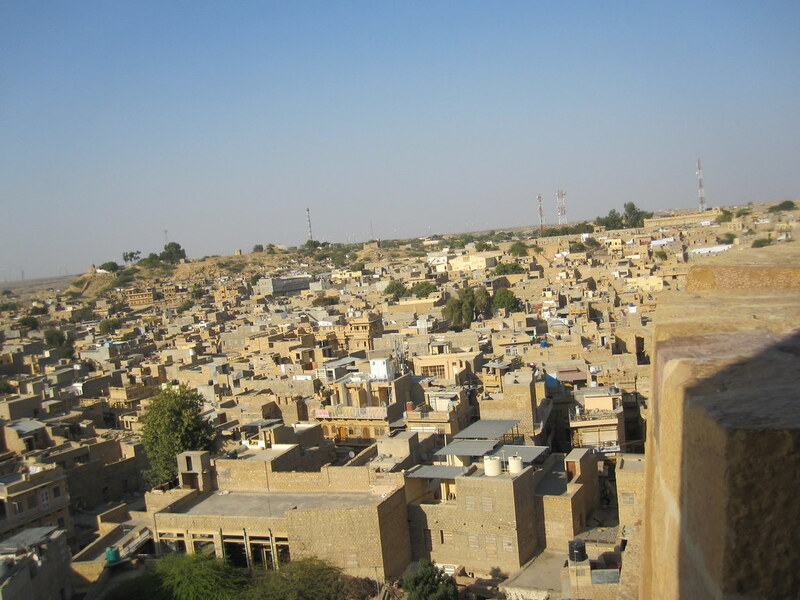 This is a view of Jaisalmer from the fort. There were some really great views. I loved wandering around the fort, looking for little nooks and crannies, taking in all the views from the ramparts. 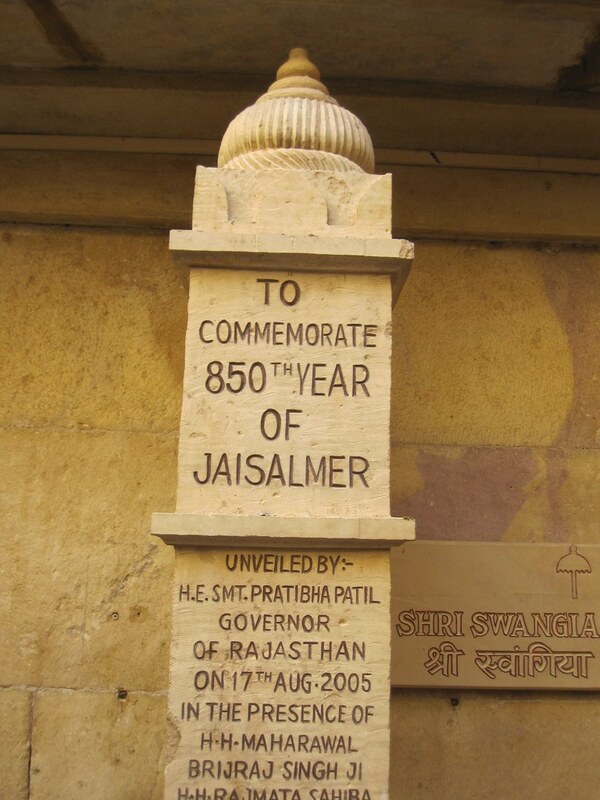 This entry was posted in Travel and tagged Jaisalmer on January 25, 2011 by Steve. It’s one of the Jain Temples in Jaisalmer. It was very ornate from the outside. I’m not sure how they did it, but it seems to me that someone carved all that ornateness in the sandstone structure by hand. If they did, they sure had a lot more patience than I ever will. Whoever the architect was, he was a marvelous technician to have a accomplished what he did with what he had. I plan on visiting the Jain Temple tomorrow. 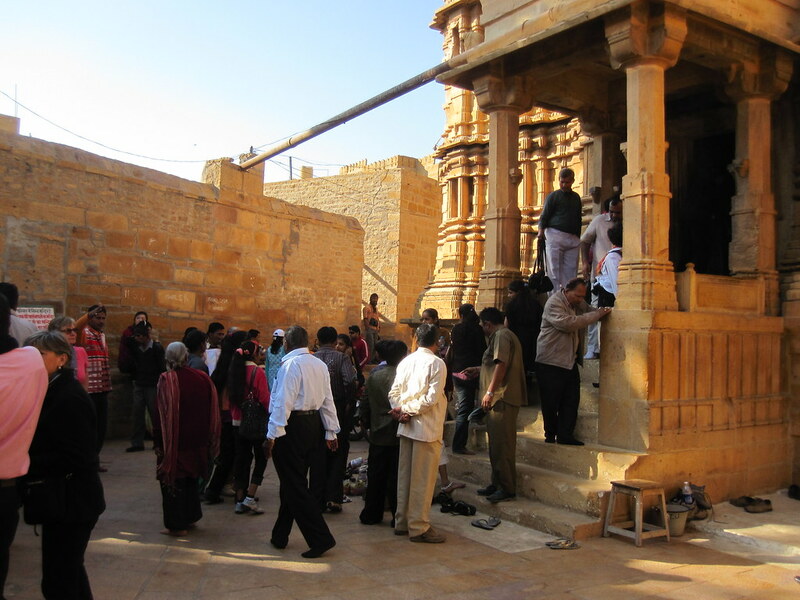 This entry was posted in Travel and tagged Jaisalmer, Temple on January 25, 2011 by Steve. It’s a great fort. Heck, it’s better than a great fort. It’s a wonderful fort. The reason? Because it’s a "nook and cranny" kind of place. It’s large and people have been living inside the walls for some 800 years, or so I’m told. I’ve read where it’s the oldest continuously occupied medieval fort in the world. Who knows if that’s true, but it makes areally good lie if it’s not. I went inside and wandered aimlessly for hours. There are some 40 hotels inside the fort, but I read it’s politically incorrect to stay in them as the commercialism is destroying the fort and not giving anything back to repair it. There are vendors everywhere in the fort. I assume mos tof them live in the fort. Anyway, if you like to wander aimlessly in strange places, this could be your-kind-of-place.